Indian carrier Jet Airways has grounded a further six aircraft amid a deepening crisis. The beleaguered company has been struggling under the weight of debts totalling more than than $1bn (£750m). The airline has delayed payments to banks, employees, suppliers and even aircraft lessors. A pilots' organisation warned that its members would stop flying for the carrier if their salaries were not paid by the end of March. In a letter to the National Stock Exchange of India on Tuesday, company secretary Kuldeep Sharma said: "An additional six aircraft have been grounded due to non-payment of amounts outstanding to lessors under their respective lease agreements." He said the airline was trying to "improve its liquidity". But at least 50 of those aircraft have been grounded. Industry regulator the Directorate General of Civil Aviation has asked the airline to refund passengers, or provide alternatives, if their flights are cancelled. On Tuesday, the National Aviators Guild warned the Jet Airways management that members would stop flying for the airline from 1 April if their salaries were not paid. They also demanded the implementation of a "resolution plan" for the airline's financial issues which was announced a few weeks ago. "If there is no proper clarity on the resolution process and salary payments, by 31 March, we will stop flying from 1 April," the guild said. Pilots and other senior airline staff have not been getting their full salaries since December. Meanwhile, the Press Trust of India reported that the airline's aircraft maintenance engineers' union had written to the Indian aviation regulator to say that three months of salary was overdue, and flight safety was "at risk". The Jet Aircraft Engineers Welfare Association (JAMEWA) said it had been hard for engineers to meet their own financial commitments, adversely affecting their "psychological condition". "Therefore the safety of public transport airplanes being flown by Jet Airways across India and the world is at risk," it said. At the heart of this crisis is Naresh Goyal, the founder of the airline. Etihad, which owns a 24% stake in Jet Airways, had agreed to pump in more money and take control of the airline. But the deal got stuck after Mr Goyal refused to step down as Jet Airways chairman. The same thing happened a few months ago when India's largest conglomerate the Tata group also showed interest in buying the airline, but then stepped back when Mr Goyal refused to resign from the board. Reports now suggest that Etihad wants to sell off its entire 24% in the airline and exit the business. Jet Airways was India's largest carrier in the 2000s, but it started to lose market share after the entry of low-cost airlines like IndiGo & SpiceJet, who were able to optimise costs and make money in this hotly contested aviation market. With a huge aircraft fleet and permissions to fly on many valuable international routes, Jet Airways is an attractive proposition for many investors in the market. But their condition is simple - that Mr Goyal and his family, that own a majority stake in the airline, need to exit the business. Analysts say Mr Goyal's stubbornness in not stepping down is making it difficult for the airline to find investors. Given that elections are round the corner, the government is putting in effort to rescue the airline. But even Indian banks are wary of investing in the airline given its precarious situation. 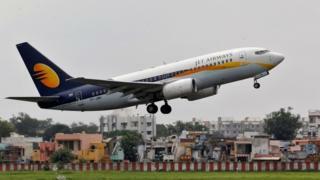 There are reports the Indian government has asked state-run banks to step in and save Jet Airways. India urged state-owned banks to swap debt for equity, and take stakes in Jet, news agency Reuters said. The Indian government wants to avoid job losses ahead of a general election. The government has been asking state-run banks including SBI and Punjab National Bank (PNB) as well as the 49% state-owned National Investment and Infrastructure Fund (NIIF) to take at least a third of the airline until new buyer can be found, the news agency said.